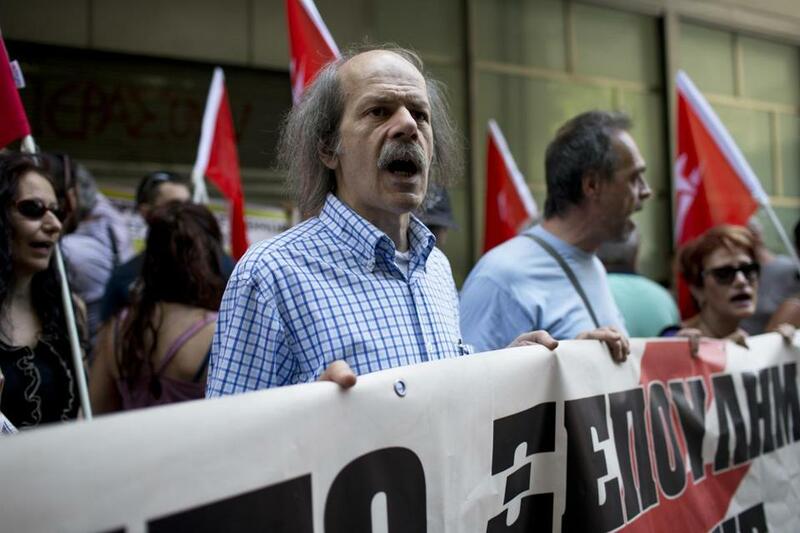 Workers from the state-controlled Public Power Corporation protested outside the Finance Ministry in central Athens on July 11. Last year’s third bailout of Greece, imposed by Europe and the International Monetrary Fund, does to Greece what Versailles did to Germany: It strips assets to satisfy debts. Germany lost its merchant marine, its rolling stock, its colonies, and its coal; Greece has lost its seaports, its airports — the profitable ones — and is set to sell off its beaches, the public asset that is a uniquely Greek glory. Private businesses are being forced into bankruptcy to make way for European chains; private citizens are being forced into foreclosure on their homes. It’s a land grab. And for what? To satisfy old public debts, incurred for tanks, submarines, the Olympics, big construction projects outsourced to German firms, and to hide deficits in health care, with creditor connivance — a quagmire of graft to support an illusion, that Greece could “compete” as part of the euro. Already in 2010 the IMF knew it was breaking its own rules by pretending that Greece could recover quickly, sustain a huge primary surplus, and repay its debts. Why? To help save French and German banks, which the IMF’s sainted managing director, Dominique Strauss-Kahn, wanted to do, because he wanted to be president of France. Europe crushed the Greek resistance in 2015. Not because Wolfgang Schäuble, the German finance minister, thought his economic plan would work; he candidly told the Greek finance minister, Yanis Varoufakis, that “as a patriot” he would not sign it himself. But Germany wants to impose its order on Italy and on France, where civil society continues to fight back. And Chancellor Angela Merkel could not admit to her voters, or to fellow Europeans from Slovakia to Portugal, that back in 2010 she’d saved Germany’s banks by saddling them with Greek debts that could never be paid. Greece was given collective punishment as a lesson. It was done to show that “there is no alternative.” It was done to stop any other attempt to develop, articulate, and defend a more rational policy. It was done to protect the power of the European Central Bank, the German government in Europe, and the policy-making authority, in face of a long record of failure, of the IMF. Greece is now a colony — the polite say “protectorate.” Elsewhere in Europe the left — Podemos in Spain, the Left Bloc in Portugal, Die Linke in Germany — has stalled out, for now. In France the Socialists are destroying themselves. Italy alone is interesting: It is in the midst of a banking crisis whose only solution is stronger growth; this requires the government to defy Eurozone doctrine or it may lose power to the radical Five Star movement soon. But, apart from that one case, progressive Europe is blocked. Next up will be the far right, especially the National Front in France, which if it came to power would blow the European Union apart. Similar pressures are building in Poland and Hungary, which have governments already outside of European democratic norms. In Britain, right-wing Tories and the UK Independence Party have combined to vote the UK out of the European Union — although with surprisingly moderate political results so far. That is why Europe needs the Democracy in Europe Movement. DiEM25, started by Varoufakis, is a new transnational European progressive movement. It is just getting underway, and it may go nowhere. But it presents a last, slim hope of holding the European Union together on terms that the peoples of Europe might accept. Democracy would come by small steps at first. Transparency and accountability for Europe’s opaque governing institutions would come first. After that, an economic policy focused on jobs, investment, and sustainability. Ultimately there would have to be big changes, as revolutionary as the 2015 Athens Spring. The old oligarchies, the Brussels cabals, the self-serving technocrats, and the economic ideologues who now dominate European economic policy would have to yield. James K. Galbraith is the author of “Welcome to the Poisoned Chalice: The Destruction of Greece and the Future of Europe.’’ He teaches at the LBJ School at the University of Texas at Austin and he assisted Greek Finance Minister Varoufakis in 2015.